My friend M is like a bowerbird. He collects good quality cast offs and hand me downs and adds them to his already vast hoard. He’s choosy though, he only wants good stuff, useful stuff, and he often accepts things with an eye to passing them on. He recently offered me an almost new Le Creuset cast iron covered terrine dish that had been discarded by one of his benefactors. I traded my large, no longer used, unloved French round bottomed copper bowl for the terrine. It was a win/win deal. Having a serious French terrine dish asked for a serious French terrine to be made. 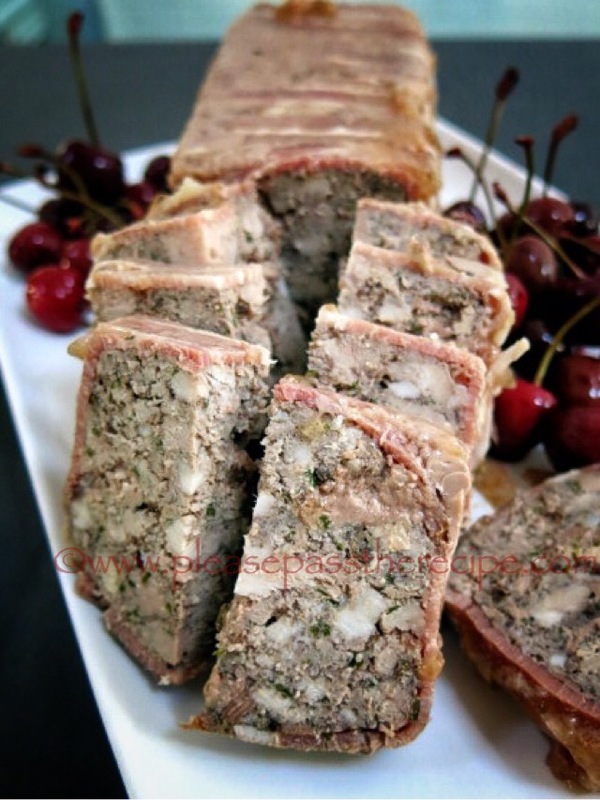 My Pork and Pistachio Terrine has been a favourite since the kids were small as have the fancy meatloaves I throw together with minced turkey or chicken. We call them terrines simply because my Mum’s meatloaf was always made with beef. I turned to Monsieur Escoffier to get a traditional viewpoint. He helped narrow my options down to the meats I chose and whether they would be minced and/or chopped. Escoffier went to great lengths to explain that terrines, galantines and raised meat pies need a forcemeat, a binding agent to hold the feature ingredients in place. A basic terrine made entirely of forcemeat is like a plain meatloaf, but I had decided I wanted a serious looking and tasting terrine. I chose a forcemeat made with pork mince and finely chopped chicken livers to anchor diced duck breast and pork belly. Baking the terrine in a water bath, then weighting the it while it chills guarantees a dense texture with no air pockets. The rich flavours of my French style terrine went perfectly with pickled cherries and side dish of radicchio salad on the Christmas table. It was a sophisticated and well liked inclusion, but the best part was the leftovers which we enjoyed smashed onto toast with cornichon over the next couple of days. High quality charcuterie, so Frenchy, so chic…. Grease a large loaf tin or covered terrine dish. Trim the sinews from the chicken livers and finely mince them with a knife. Cut the pork belly and the duck breasts into 1cm dice. Using wet hands thoroughly mix together the meats, eggs and brandy. Don’t be tempted to use the mixer or processor as maintaining a chunky texture is important. Sprinkle over the spices, seasonings and herbs then knead them through the meat. Chill until ready to bake. Line the terrine dish with bacon rashers, leaving an the length to fold back over the top. Pack the meat tightly into the bacon lined dish then enclose it with the bacon flaps. Place a strip of buttered baking paper over the top, then cover with a lid or some foil. Put the terrine dish in a deep ovenproof tray in the oven then fill the tray with boiling water until it comes half way up the side of the terrine mould. Bake for 1 hour or until the terrine feels firm and the meat juices run clear. While the terrine is resting cut a piece of cardboard to fit snuggly into the top of the dish and wrap it in foil. Place the foil covered cardboard over the baking paper on top of the terrine then place some cans of food on top as weights. Chill the terrine for 24 hours beneath the weight. Delicious with pickled cherries or cornichon. Thanks for the background information. My mouth is watering for a slice with a pickled cherry and a glass of wine! Looks delicious. Now that’s a good kind of friend to have! My Le Creuset terrine hasn’t been used much lately. Must remedy that. Go for it Michelle, dust the cobwebs off the terrine dish and get Steve meat gxrinding! This ‘Terrine chez toi’ could easily become ‘Terrine chez moi’ – At this stage of a late reading I shall conveniently forget that pates and terrines really are not supposed to be on the menu these days and look how appetizing yours does look 🙂 ! [OMG – even have a le Creuset pate pan from about three decades back!!!] Absolutely love the balance twixt the bits/pieces and forcemeat of yours!!!! Thanks Eha, i’m an advocat of all things in moderation, including terrine! I love terrines for summer luncheons because they need to be done, at least a day ahead. Perfect, no preparation on the day. I do love a good terrine! You can get really creative with these. So lucky in your friends and the acquisition of a le cruset terrine dish. One of my favourite combos is rabbit with hazelnuts – or a simple a coarse pork terrine that uses pork liver as a forcemeat. Oooo rabbit and hazelnuts sounds delicious! I don’t cook game meats enough! Tres chic and Frenchy! Oh la la! This looks superb Mrs Recipe and reminds me of my mums best friends (who was a caterer) terrines she made back in the in the late 70’s. A thing of beauty. Thanks Cheery, after reading Escoffier I came to the conclusion that anything goes, as long as there is enough glue to hold the big bits together. You really can get creative! This entry was posted on January 20, 2015 by ladyredspecs in FODMAP diet, Food, Gluten Free, Lactose Free, Light Savoury Dishes, Main Meals, Pork and veal and tagged duck, livers, meatloaf, pork, terrine.